Sales volume has slipped this year primarily because inventory levels are down. However, we have noticed a slight trend in the past few months worth noting. Inventory levels actually rose in September for single family homes, albeit only 5 homes which is rather insignificant. Because sales are less, it did raise the standing inventory to a 3.5 month supply, up from 3.4 months the previous month. Both numbers are low. 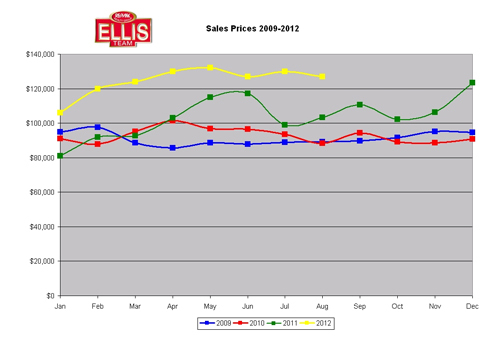 Another trend we are watching is the median sales price, which has fallen for 2 consecutive months. This is a seasonal trend we see this time of year so we are not alarmed. Heading into season we’re going to need all the inventory this market can muster, and right now it may not be enough. Prices are still much higher than last year. We would have liked to see home prices rise the past few months, but not for the reasons you might think. 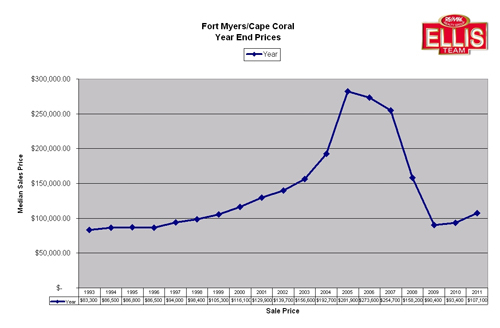 Fort Myers, Cape Coral, Naples, and all of SW Florida is considered a declining market by FNMA and Freddie Mac. The appraiser usually notates this on the appraisal report to the lender. According to guidelines, and area must have 3 consecutive quarters of rising prices to break a declining market tag. Lee County had a strong 4th qtr 2011 and 1st qtr 2012 but came up short in 2nd qtr. This contradicts our data so I’m not sure how they calculate this. I’m hearing whispers that the tag may come off Collier County Florida in January, but we’ll wait and see if that actually happens. The reason this is important is because it removes additional restrictions and paperwork requirements when the tag is lifted. FNMA is already making loans tougher this November with new guidelines. For instance, self employed borrowers will find it more difficult and cumbersome to receive a mortgage. They will require personal and corporate tax returns for last 2 yrs no matter what. Lenders are just now receiving the new guidelines and sifting through the changes. September is seasonal, and it’s not uncommon for sales to lighten this time of year. It does feel on the street as though there’s a dichotomy to the market. Agent listings seem to either get a ton of activity and offers or very little. This may change in the next few months as snowbirds tend to scoop up higher priced inventory for second homes and investment. The upcoming election may have also stifled buyers who are afraid to make a big purchase until the see which leadership will guide the country and what the new economic landscape may look like. We’ve seen on TV many company CEO’s waiting to make hiring and firing decisions until after the election, and it’s quite possible buyers will do the same. If you’re worried about your job, chances are you’re not in the market to change your housing. Once the election is over, the direction the nation and economy goes in may become clearer, and consumer confidence could rise. If and when that happens we believe SW Florida is poised to take advantage with lots of potential for price appreciation. All signs point to higher once the job outlook improves, and help may be just around the corner. The other day a seller was asking me the typical things I hear buyers and sellers say. 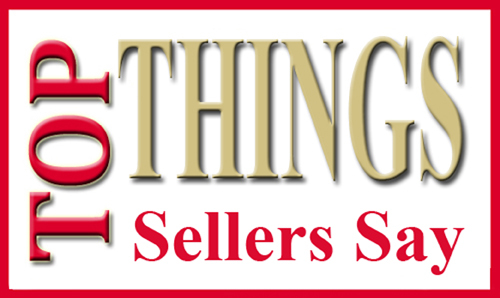 That question sounds like good material for an article, so this week we’ll focus on the seller side. Things Sellers Say! That house was a short sale– Sellers really don’t understand how other sales in area affect their value. A short sale is a compromise by the bank to allow a seller to sell their property at today’s current value. Banks aren’t in the business of taking a larger loss than they should, so the bank typically does its own evaluation to determine the seller has accepted a contract at or close to fair market value. If not, the bank typically counters what they’re willing to accept. Short sales became the new market. Some foreclosures sold too low, and some are in terrible condition. It’s important to compare condition to any sale, and a skilled Realtor or appraiser should take this into account. It’s only been on the market a week– We hear this when an offer comes in soon after it hits the market and it’s not quite full price. There’s an old saying that your first offer is usually the best offer. Believe me, this saying is not always true, but I could tell dozens of stories where a seller wish they had that first offer back months after its passing. We can always price it high and take less-Sellers think they’ll get more money by asking more, but this is rarely the case. In fact, they typically get less by overpricing it. The overpriced listing sits on the market and becomes stale. Buyers wonder why it’s been on the market so long and they become fearful. When they do eventually offer after several price reductions, they typically offer much less. It’s always best to price it at the market and hopefully attract one or more buyers. This way you avoid becoming stale and having that stigma that something is wrong with the home because nobody wants it. I don’t want a sign up because I don’t want my neighbors to know-Your neighbor is going to find out anyway. In fact, your neighbor might be glad to see you go and may know a friend who’s looking in the area. A sign call is always a good call because unlike an ad, a passing buyer knows exactly where it’s located and cared enough to call. The sign is an additional tool that sometimes pays dividends. We don’t need to sell– Very few people absolutely need to sell. Many make the choice to sell because a change better suits their needs. I think sellers say this to slow down the process. They are fearful and don’t want anyone taking advantage of them. They want to sell, but want some control over the process. Selling is a process no one party controls. It takes a buyer and seller, and the seller typically is not looking forward to that whole process. This is where a good Realtor can help alleviate that stress and counsel the seller. Sellers feel much better going forward once they understand the process and the true market value. If it’s meant to be it will happen– Actually buyers and sellers use this one a lot. To my way of thinking, this is a way of shielding the seller from the tough decisions, a defense mechanism so to speak. I’ve learned in life if you really want something you tend to get what you go for. If it’s to be it’s up to me. If you sit back and let someone else decide your fate, you might not like the outcome. It’s always best to look at all the facts and make a decision. This way you control your own destiny instead of relying on fate. This market is littered with people who put their head in the sand because they felt powerless. You can’t sell what you don’t have, and the SW Florida real estate market has much less inventory than it did a few years ago. We’ve been reporting for a few years how demand has outpaced supply and that is one reason why prices have gone up in the past few years. Keep in mind too that the year end numbers are an average of the year, so numbers at end of a year could be higher than the year’s average, which is especially true in a rising market. Another phenomenon we predicted a few years ago was the “No-Man’s Land” market. We knew that one day we would exhaust much of the distressed inventory and traditional sales would once again have to fill the demand. Prices would have to rise, but they couldn’t rise enough to make certain sellers whole as so many are still underwater on their mortgages. They’re not in risk of default, but they’re riding out the market until prices rise enough to payoff the mortgage. Sellers would like to sell but don’t wish to harm their credit by doing a short sale, so they wait. Prices are surely rising, but there is a limit. The economy isn’t good, so that caps the rise. Prices have to rise, but they can’t rise to 2005 levels because the job market and the economy won’t sustain those levels. We could argue that the 2005 economy couldn’t either and that’s why it collapsed. The economy was running on borrowed money. Consumer spending was fueled by equity lines and other borrowed money. Everyone knew the clock would run out, and it did. Going forward, most people view the market as a supply and demand market, and that theory works as long as economic conditions are the same or similar, but with a tremendous downturn in the economy, prices cannot rise quickly enough to make many sellers above water, so they will sit on sidelines unless something happens to their employment. We see incremental listings hitting the market as prices rise. It probably won’t be enough to satisfy demand, so buyers should be prepared for multiple offer situations as soon as good properties enter the market. As you can see we only have about 3.4 months supply of inventory on the market and current single family inventory is only about 3,730 heading into season. Interest rates are artificially low due to Fed policy of buying down interest rates trying to stimulate the economy. Buyers who can purchase now will be crazy to wait as prices years from now should be higher, and borrowing costs will be higher when the Fed action is completed, but competition for homes is expected to be great this season. If I were a buyer I would get on an email notification list from an agent that emails you the day new properties enter the market that match your criteria. The Ellis Team has such a system as do many agents. You’ve heard the saying, “The Early Bird Gets the Worm” and it’s true now and will be blatantly evident this season. Hopefully after November we’ll have clarity as to which way the politicians are going which may give businesses clarity so they can begin hiring. Our nation has been in an economic freeze. Our local market is set to take off once the economy returns, and that will sure be a welcome sign so we can escape the No Man’s Land. If you’re a buyer and need help, feel free to call us at 239-489-4042 or visit our website www.Topagent.com If you’re a seller, we can guide you through the selling maze whether you’re a traditional seller or a short sale. 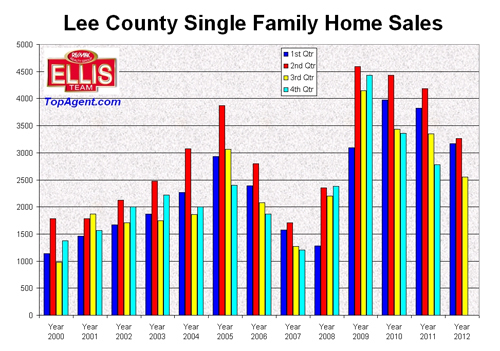 Last week we showed statistics about the Lee County Florida distressed market and compared today’s numbers to each month dating back to August of 2011. This week we’d like to illustrate how prices have fared and compare them dating back to 2009 for some perspective. Median prices rose to $127,000 this year versus last August when they were at $103,200. That’s a healthy 23.06% rise in prices from last year. As you can see from the graph that shows the last 4 years of data, about this time of year we can have some seasonal price adjustments to the downside before they start heading back up around November. Prices actually fell slightly from July 2012 to August 2012, down 2.23% from the previous month. We don’t get too concerned about monthly swings as we like to look at overall trends. The reason is certain properties may be scheduled to close one month and fall into the next month due to delays by the lender or title. If 100 properties are delayed it just depends on the mix of properties and their prices as to how it affects the median price for the previous month. This all works itself out over time. As you can tell from the long term trend we’re riding high in 2012. Foreclosure filings are close to the same levels in 2012 as they were in 2011 so it doesn’t look like there is a huge wave of foreclosure heading to the market. We’ve had much uncertainty in the market due to the upcoming presidential elections as well as the tax increases headed our way in January. Not only will we have tax increases but we’ll have certain job cuts which will ripple through the economy. This has created uncertainty and made businesses reluctant to hire until these issues are sorted out. We may start to see price increases about December, or the hangover from the elections may carry over into Main Street and help keep the status quo for awhile. Ordinarily you would think we’d be poised for price jumps as inventory is down but we don’t think we’ll see the big price increases until jobs and the economy picks up. We have several factors in play right now. The old supply/demand theory is still in play, and we have to add jobs, income, and consumer confidence into the equation as well. Assuming we get an actual plan to deal with our budget, and that’s a big if, businesses can start planning again. If new taxes aren’t too onerous hopefully we can get a balanced budget and a plan that allows the economy to add jobs. If and when this happens real estate is poised to take off in SW Florida. If this d doesn’t happen real estate should hold its own and have modest gains over time. 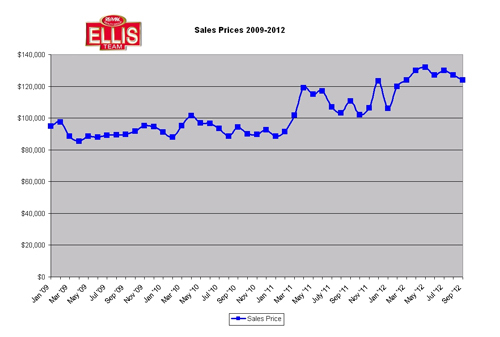 Our prices are still pretty low even though they’re higher than the bottom in 2009. The Ellis Team is selling homes. We just opened a new Free MLS property search site people may find easier to use at http://www.AllSWFLrealestate.com/ Let us know how you like it. If you have a home to sell you should talk to us. 239-489-4042. If you’re looking to buy your piece of paradise, let one of our knowledgeable and friendly buyer specialists guide you through the maze. Give us a call; you’ll be glad you did.